Asset allocation is to investment planning what the foundation is to a house or the chassis is to a car. It’s what everything else is built upon. And just as important as constructing a house on a firm foundation, having the right asset allocation can be vital to helping you work toward your financial goals. Goals. These are simply what you’re investing to achieve. For many of us, a major goal is to enjoy a financially secure retirement. If you have younger children or grandchildren, helping them afford higher education without building a mountain of debt is likely another goal. Or maybe you’d also like to make a luxury purchase – such as buying a vacation home or dream car or taking an exotic vacation – down the road. Time horizon. One reason why knowing your goals is important is because it helps determine your time horizon (how long you have until you need to tap into your investments). If you’re 28, for example, and want to retire at 68, your time horizon is 40 years. Simple as that. Risk tolerance. Your risk tolerance is the amount of volatility in your portfolio’s value you’re comfortable with. If you find you can’t sleep because you’re worried about your investments – especially when there’s market volatility – you probably need to adjust your asset allocation to suit your risk tolerance. Stocks. Historically, stocks have offered attractive returns, but along with those returns, there have also been periods of volatility. If you’re young, you should have a long time horizon – especially when it comes to retirement. That may allow you to have a larger allocation to stocks because you have longer to ride out any short-term market volatility that occurs. Bonds. One reason investors like bonds in a portfolio is because their prices have historically been relatively stable. By owning bonds, an investor’s aim may be to help manage his or her portfolio’s overall value when there’s volatility in the stock market. The larger the proportion of bonds, the more steady the portfolio’s overall value should remain. Keep in mind, however, that bonds’ returns have been significantly less than stocks. Cash alternatives. These are relatively lower-risk, lower-return investments. On the upside, they can be easily be converted into cash when it’s needed. On the downside, their returns may not even keep up with inflation. Of course, there are many other investments to consider, such as real estate investment trusts (REITs) and commodities. Just remember that you should intend for each type of investment you choose to play a particular role, such as providing the potential for growth or income or stability, in your overall allocation. Alternative investments, such as those mentioned above, also have their own unique risks that you should fully understand before investing. Once you’ve decided on the types of investments to include, you need to determine how much of each is appropriate. If you’re looking to grow your investments’ value, you’ll likely have a larger stock allocation and a smaller one for bonds. The result would be a portfolio with more potential volatility than one with a larger proportion of bonds. You should ask yourself if that’s a trade-off you’re comfortable with. 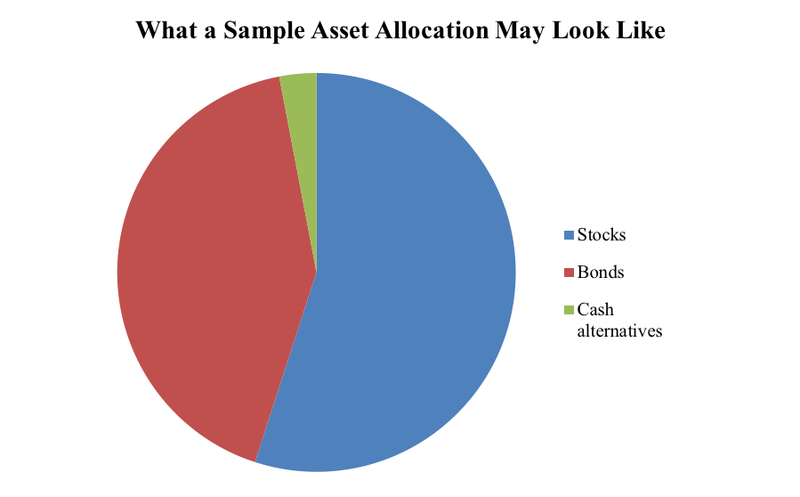 Although asset allocation is a relatively simple concept, you can see it has lots of “moving parts.” That’s one reason why many investors opt to work with a professional advisor. If you decide to seek help, look for an advisor who will first get to know you and then help create an investment plan that’s built around an appropriate asset allocation.